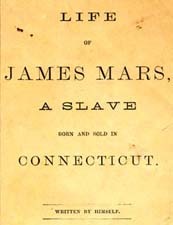 Life of James Mars, a Slave Born and Sold in Connecticut. Written by Himself. African Americans -- Connecticut -- Biography. Slavery -- Connecticut -- History -- 18th century. Slavery -- Connecticut -- History -- 19th century. Slaves -- Connecticut -- Biography.